I’ve discussed the structure of a CYOA story, the structure of a mystery, the structure of a short story, even the structure of a great story, but never the structure of a thriller. I think it’s high time to remedy that! 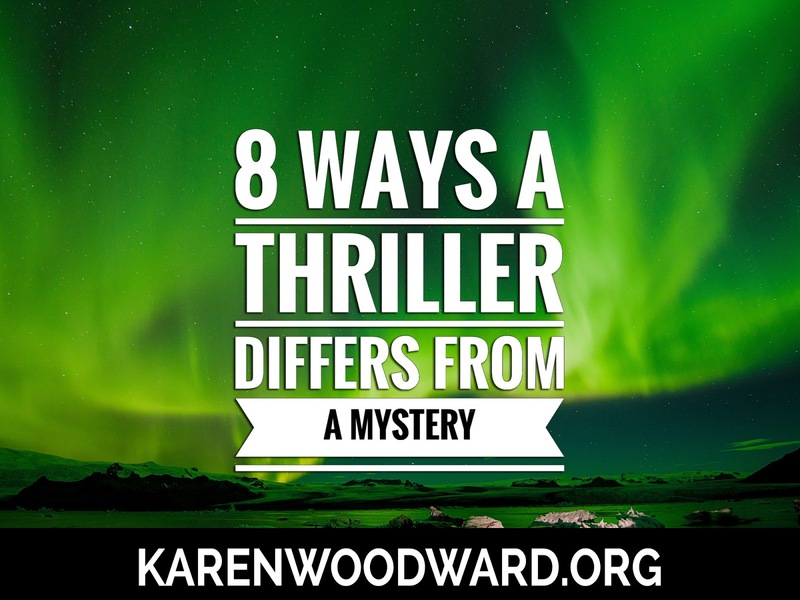 But how to write a thriller is a rather large subject, so in what follows I only look at 8 ways a thriller differs from other kinds of stories. Thrillers have a bit of everything: mystery, suspense, crime and horror. Perhaps that’s the secret of their popularity, there’s something for everyone. In a word, thrillers are supposed to be thrilling! 1. Pacing: A thriller is relentless. I’ve found that certain genres—cozy’s for instance—don’t require a huge amount of dramatic tension or, as I like to call it, narrative drive. Speaking for myself, I read cozy mysteries for the sense of community, to see the characters’ quirks and how they complicate things. To see a) WHO did it, b) HOW they did it and c) WHY they did it. Thrillers, though, I read primarily because I want to lose myself in a fast paced story that fires up the imagination. 2. There is no obvious set of suspects. One of the things that distinguishes a thriller from a cozy is that a thriller doesn’t have a clear list of suspects. Recall that in a cozy mystery the suspects are drawn from what W.H. Auden calls a “closed society” so we have our pool of suspects right from the beginning. The reader’s task is to work out which of them committed the dastardly deed. For example, a freak snow storm traps 9 people in a remote hunting lodge. Logically, the killer has to be one of the surviving 8 people. That said, many times the murderer has some sort of connection to the detective. For example, it might turn out that the killer is someone inside the detective’s inner circle, or perhaps one of the apparently minor characters involved in the case—the detective’s mail carrier, the barista that serves the detective coffee each day, his sister’s new boyfriend, and so on. For example, in James Patterson’s thriller, Along Came a Spider, one of the killers was part of the hero’s own team. In a cozy the stakes are usually modest. If the detective doesn’t solve the case then the murderer will go unpunished and the imbalance the murder created in society will not be addressed. As a result, people will be more suspicious of each other, each thinking that the other could be a murderer. Also, the sleuth’s reputation would take a considerable hit. In a thriller, on the other hand, if the murderer isn’t caught it could mean the end of the world. 4. Protagonist is a hero. Not all protagonists are heroes. A hero is someone—male or female—who has noble qualities. For instance, they are courageous and think of the well-being of others before their own. They will do what many would consider irrational things to defeat the Big Bad and save the day. Generally, whatever organization the hero is with he is cut off from. He is the rebel police officer, the journalist who skates too close to the edge, the soldier who would do anything, sacrifice anything, to save the day. 5. Antagonist is a proper villain. Another difference between a thriller and a cozy is that in a thriller the murderer is more likely to be a vicious, brilliant, psychotic, serial killer than he is a weaselly nephew who murders his cousin for their money. Or, if we’re talking about a political thriller, the villain is much more likely to be a terrorist out to destroy the free world than someone who kills in a moment of passion or because he wants to stop his most intimate secret from being revealed. 6. A lot of scenes, not many sequels. What sequels exit are short. I mentioned that thrillers were part action story and here is one reason why: sequences of scenes are strung together with only very short sequels between them. I know I use this example quite a bit—perhaps too much!—but Raiders of the Lost Ark is a terrific example of scene vs sequel length. There are sequels in Raiders, but they are very short. One sequel was about 5 seconds long, just long enough for Indiana Jones to say something like, “We’ve got to get the ark,” and then he and Marion are off to fight another battle. Let’s face it, folks don’t read thrillers because they want something to help them fall asleep! They read them for, as the name suggests, a thrill. For more on scenes and sequels see the article Scenes, Sequels, Sequences and Acts. 7. The setting of a thriller is often exotic. Exotic locations are unfamiliar, extreme, locations. Unfamiliar. For someone from the Pacific Northwest, a tropical beach would be an exotic location, but if you lived in Hawaii then not so much! Extreme. The world's largest particle collider would be an exotic location. As could a spacecraft orbiting Earth ... or Mars! A Carnival is often used as an exotic location, especially if the thriller has supernatural overtones. This is another point of departure from the cozy mystery which is often—and quite intentionally—placed within a familiar, comfortable, cozy setting. 8. An exciting, surprising, climax. While the climax of a thriller needs to reveal the identity of the murderer (the who, the why and the how) there also needs to be a twist. For instance, a classic twist comes at the end of the movie Seven when the penultimate victim is revealed to be the detective’s wife. This leads to the further twist of the Big Bad himself being the ultimate victim, killed by the detective himself. Every post I pick something I love and recommend it. This serves two purposes. I want to share what I’ve loved with you, and, if you click the link and buy anything over at Amazon within the next 24 hours, Amazon puts a few cents in my tip jar at no cost to you. So, if you click the link, thank you! If not, that’s okay too. I’m thrilled and honored you’ve visited my blog and read my post. Interesting info. Regarding $6, I had to go read the linked article. I've never even heard of sequels or sequences before. I've always thought of everything as scenes, strung together to form chapters. Thanks for the post. Like shadowferret I've never heard of sequels in this context. I have had two goes with Dragon naturally Speaking. this version might be better than its earlier iterations, but my frustration levels previously made me swear never to touch it again. Hi Rita! Thanks for your input on Dragon. It can be frustrating. Version 9 made me pull my hair out. Literally!! Version 13 seems much better in terms of recognizing speech but (of course) it's by no means perfect. Maybe one day! BTW, if you'd like to read more about sequels you could try "Elements of Fiction Writing: Scene & Structure" by Jack M. Bickham.